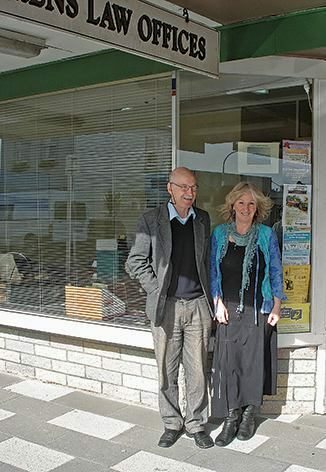 After 45 years working in the legal world, Otaki’s Daryl McLaren is retiring from his law office in Main Street in mid-September to spend more time writing poetry and working in his garden. He has a two hectare block in Taylors Road which he has been developing over the last few years, planting it in natives. He planted 10-15 kahikatea trees around the wetland earlier this year and “threw” a bit of water at them occasionally and was almost surprised to see how well they had grown. There are other kahikatea growing nearby which are up to 200 years old, he said. Although born in Murchison, Daryl began at Otaki State school in standard five (now year seven) when the family moved to Otaki in 1956. He boarded with his grandparents in Nelson while attending Nelson Boys College. He enjoyed his school days and has great memories of his first Otaki School teacher, Mr Lynskey, who was a “wonderful teacher of poetry and rote arithmetic”. He played rugby and cricket during his final primary school years and remembers scoring three tries and a conversion against Paraparaumu School in 1956! At college, his favourite sports were fives and handball with fencing in his final two years. Out of school activities included “shooting rats over at the dump, which was just behind the state house we lived in. Mum was always aghast at the condition we came back in!” he laughed. With school days over, Daryl attended Victoria University in Wellington where he completed first is bachelor degree in law followed by completing his LLM – Master in Law. He worked with two law firms in Wellington for the next five years and in 1970 he married Annabel (Wright) in 1970. They moved to Otaki in 1975 where he has practiced ever since. During his school days science held a great fascination for Daryl – his night time reading was physics and astronomy! He admits he would have loved to do science but law took a greater hold and was the field he followed and in later years became involved with Maori estate and land laws. Over the years he joined Annabel on many tramping trips and supported her decision to take up journalism again publishing in 1991 the monthly issued Otaki Mail; named after the earlier daily Otaki paper of that name. He enjoys following his three daughters lives, eldest Myfanwy – Miffy, Liberty- Libby and Esther, all previous Otaki School and College students and his three grandchildren. Miffy and Libby followed their father into law and Esther after starting out in law, followed in her mother’s footsteps into journalism. Miffy is based in London where she specialises in commodity derivative trading. Libby is in Wellington and worked with the Waitangi Tribunal for a while before moving into banking law. After stints on the Nelson Evening Mail and Dominion and public recruitment journalism in Sydney, Esther now tutors in journalism, from home, for the Massey University journalism course. Writing, gardening and tramping are among Daryl’s main interests, though his poetry is very important to him. Daryl wrote the poem on the memorial to Annabel in the Otaki library. (see below) “It’s a beautiful poem of Annabel, it immortalises everything Annabel was – her writing, teaching, journalism, horse riding and a mother,” he said. While he will have more time to enjoy developing his wetland garden and writing, Daryl will continue as a consultant particularly on Maori estate and land law, for a time.